While you can perform many administrative tasks for your OMS account from your OMS workspace, there are a number of settings that you will only be able to configure from the Azure Portal or using relevant PowerShell cmdlets. 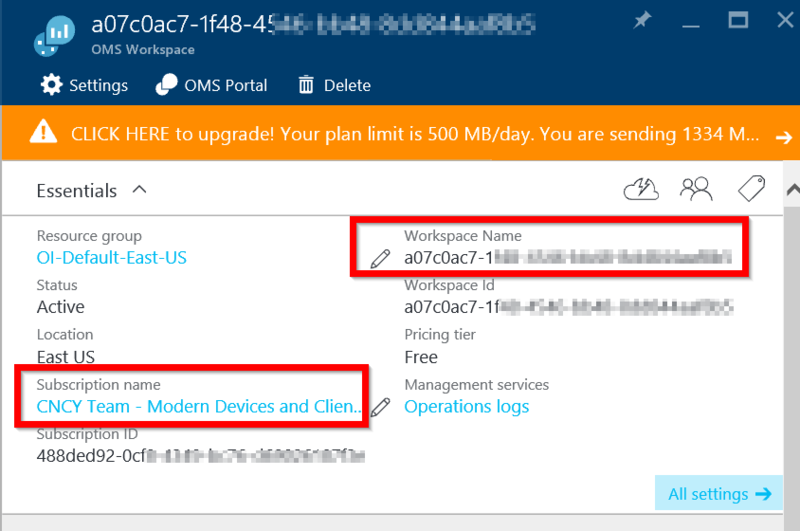 I’ll cover the range of settings that you can configure from your OMS workspace and the Azure portal in another post. In this post I will show you how to move your OMS workspace to a new Azure subscription, regardless of how you created the workspace, and explore some gotchas I’ve encountered during my extensive travels in OMS land. The Microsoft Operations Management Suite Website. How you choose to create the OMS workspace is entirely up to you, and I’ve found both methods to be seamless, and rather intuitive. But for the purposes of associating a workspace with a Azure subscription, you will find it easier to create your Log Analytics instance from within your Azure subscription because it immediately prompts you to link to a subscription that your account has requisite permissions to, as seen below, and thinking of the resource management and logical grouping paradigm, this is the better way to go, subjectively speaking. This is in addition to the other benefits of linking to a Azure subscription upon creation, including that you now have your Azure portal and OMS workspace access associated to your Azure account, and can change workspace plans ( pricing tiers) by virtue of this. etc. 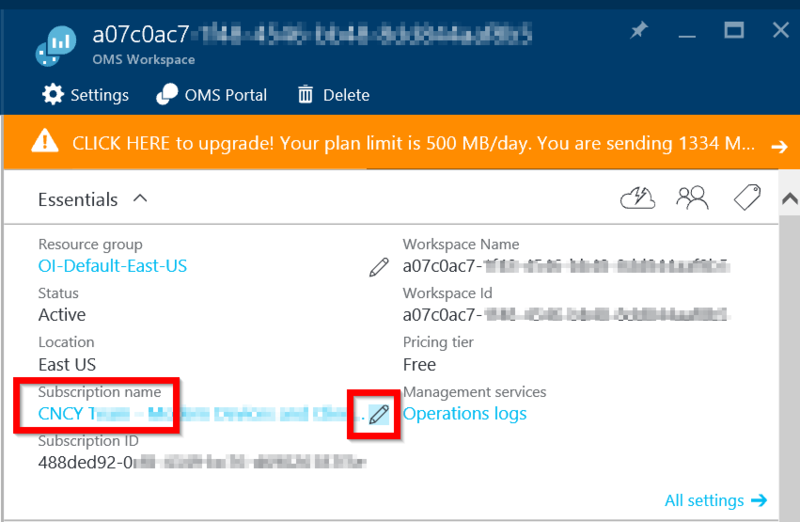 A OMS workspace was created by someone else and linked to a free-trial Azure subscription. 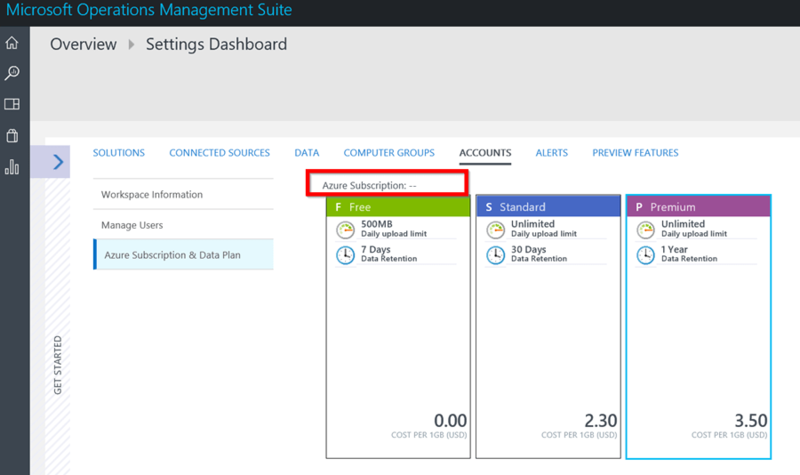 You need to associate this OMS workspace to another Azure subscription. What Azure Subscription is my workspace Associated with? Let’s review the general scenario here. You created a OMS workspace and linked to a ‘pay-as-you-go’ (NOT free trial) Azure subscription. 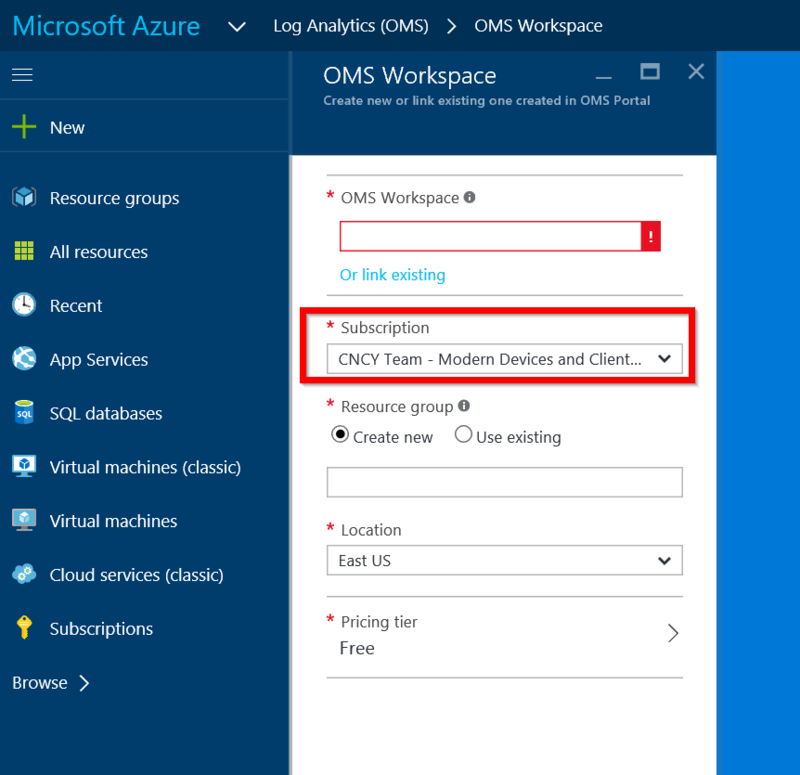 To determine what Azure subscription your OMS workspace is linked, you can do this from the OMS workspace. Sign into the OMS workspace. In the Settings Dashboard, click on the Account tab. 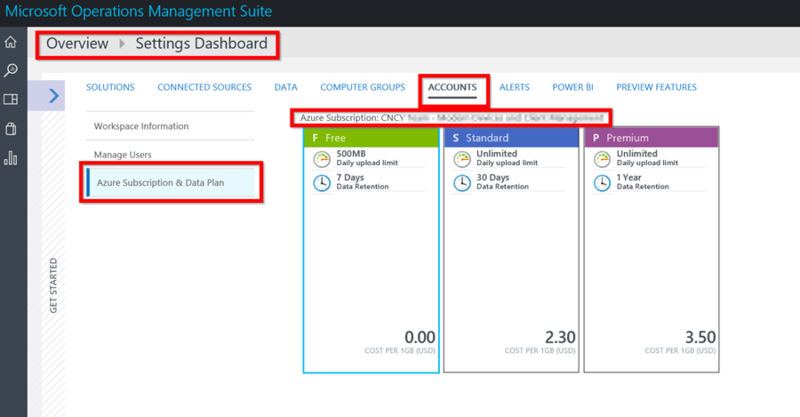 In the accounts space, click on Azure subscription & Data Plan. Browse for Log Analytics (OMS) and then select it. Select your workspace from the list of existing workspaces. In this scenario, which really isn’t that farfetched, you or someone else creates a OMS workspace, and associates it with a free-trial Azure subscription. This is fairly straightforward if you have your Azure accounts in order, and sign into the Azure portal with the same account that you use to authenticate to the OMS workspace. If this isn’t the case, here are some issues you could encounter with this scenario. When linked to a free trial, it doesn’t appear that this is indicated in the OMS workspace as shown below. The subscription field could be blank, and you can safely surmise that the workspace is linked to a free-trial subscription. 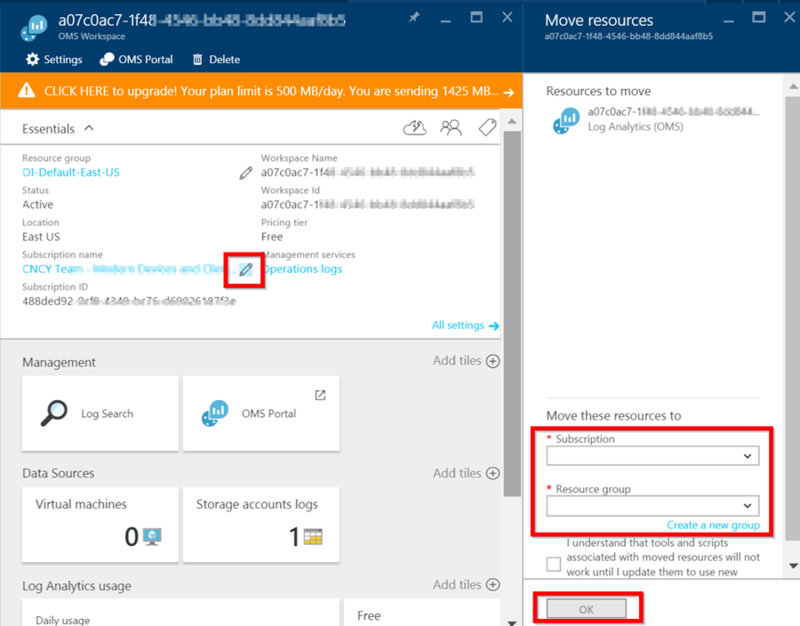 You change the Azure subscription that your OMS workspace is linked to, in one of 2 ways. Use the Azure PowerShell Move-AzureRMResource cmdlet. Change the Log Analytics properties from the Azure portal. Browse for and select Log Analytics (OMS). Select your workspace from the list of existing workspaces (if this is a free-trial subscription, you’ll likely have the single workspace here). Under Essentials, find the subscription name and click the edit icon. in the resulting Move resources window, select your new subscription, and resource group. (this assumes that your Azure account has requisite access to more than one subscription). If you encounter any other wild scenarios, I’ll be taken aback, but happy to review. Cheers mates!